Retin-A Gel 0.025% For The Full Course Of Treatment. Retin a gel is an oil-free topical medication designed, among other things, to treat acne, spots, blackheads, pimples and whiteheads. Given its oil-free nature, it is particularly useful for people with oily skin. While this formula is widely renowned for its results in relation to acne, patients reported to have witnessed significant improvements in their overall facial appearance as well. It may also be used as a skin lightening agent, and Retin A Gel is the only topical formula that has scientifically been proven to improve wrinkles. RETIN A GEL is milder than its 0.01% counterpart, so if you are new to the product, or have a very sensitive skin, than perhaps 0.025% might better suit your needs. What is Retin-A gel used for? Retin a gel is a topical medication used to treat acne vulgaris, to prevent the formation and spread of pimples (papules), spots or whiteheads (pustules) and blackheads (comedones). Retin a gel is an oil-free gel, particularly useful for oily skin and works by combating the processes in the skin that cause clogged pores and lead to pimples, spots and blackheads associated with acne, helping to clear up these skin blemishes as well as preventing the outbreak of new acne. How does Retin-A gel work? Retin-A gel 0.025% contains tretinoin, which is an active metabolite of Vitamin A that binds to intracellular receptors and modifies the way skin cells behave. Comedones (blackheads) form in hair follicles that become blocked by excess keratinized (hardened) epithelial skin cells. 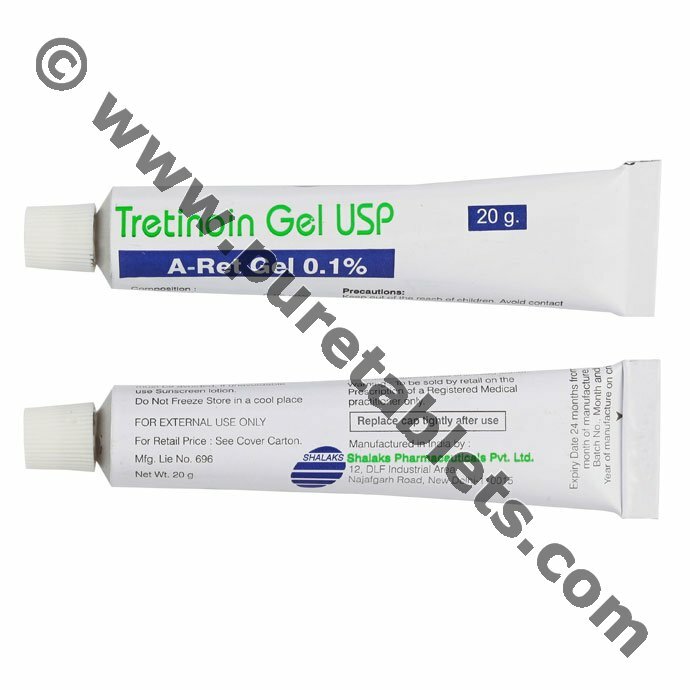 Tretinoin in Retin-A gel 0.025% is a keratolytic medication that prevents formation of new pimples and blackheads by blocking the hardening processes of the outer skin layer (keratinisation and cornification) and increasing the shedding of old hardened skin cells, while at the same time promoting growth of new skin cells. The combined effect of these actions is to speed up skin cell turnover, clear up pimples and blackheads and reduce the spread of acne. What does Retin-A gel contain? Retin-A gel 0.025% contains the active ingredient tretinoin 0.025%, a topical keratolytic medication used to treat acne. Retin a gel contains tretinoin which is an active metabolite of Vitamin A and a keratolytic medication that changes the way skin cells grow and behave. Acne forms when over stimulation of the sebaceous glands (oil producing glands in hair follicles), which often happens in response a surge of androgen hormones at puberty, causes pores to become clogged with dead skin, and leads to the formation of new pimples, whitehead and blackheads (comedones), which can become infected and inflamed. Tretinoin in Retin-A gel 0.025% prevents formation of new pimples and blackheads by blocking the hardening processes of the outer skin layer (keratinisation and cornification) and increasing the shedding of old hardened skin cells, while at the same time promoting growth of new skin cells. The combined effect of these actions is to unblock pores and prevent them becoming clogged and inflamed, which reduces the outbreak of new pimples as well as clearing up existing blemishes; also to speed up skin cell turnover and help the natural exfoliation process of the outer skin layer, which helps clear up pimples and blackheads and reduces the spread of acne. What are the side effects of Retin-A gel? The most commonly reported side effects when taking Retin-A gel 0.025% include itching, dryness, redness, burning or peeling at the site of application; these effects are usually mild and happen when you start treatment. When should Retin-A gel not be used? * are exposed to sunlight for prolonged periods; if unavoidable use a sunscreen and protective clothing over treated areas to protect the skin. Should you avoid exposure to sun? You should avoid or at least minimize unprotected exposure to sunlight, including sunlamps, while using Retin-A gel 0.025%, as tretinoin can increase your sensitivity to sunlight and may cause burning. Also if you have sunburn, you should wait until your skin has healed before using Retin-A gel. If you cannot avoid exposure to sun because of your occupation, for example, make sure you use a sunscreen and protective clothing over treated areas to protect the skin. How should Retin-A gel be used? You should apply your Retin-A gel 0.025% to the affected area of the skin once daily, preferably in the evening before going to bed. Clean the skin with a mild soap or soap-free cleanser, rinse with water then apply a small amount with clean fingers and rub gently into the skin. Do not use large amounts or apply Retin-A gel 0.025% more often than directed, as your skin will not clear up faster; instead you may increase the chance for side effects like skin irritation. Avoid contact with the eyes, eyelids, inside of the nose and mouth, which are easily irritated areas, or other areas where treatment is not intended. Do not apply to severely inflamed skin or to open lesions. You should continue to use your Retin-A gel 0.025% for the full course of treatment as directed by your doctor, until your skin has cleared up and there are no more acne lesions, which may take up to 7 weeks, although you should see signs of improvement after 2 weeks. You may continue to use your Retin-A gel 0.025% to maintain your skin after the acne has cleared, depending on your doctor’s recommendations. How long should you use Retin-A gel? You should continue to use your Retin-A gel 0.025% for the full course of treatment as directed by your doctor, until your skin has cleared up and there are no more acne lesions, which may take up to 7 weeks, although you should see signs of improvement after 2 weeks. You may continue to use your Retin-A gel 0.025% to maintain your skin after the acne has cleared, depending on your doctor’s recommendations. If you miss a dose of Retin-A gel 0.025% apply it as soon as you remember, unless it is time to take the next dose, then skip the missed dose. Do not take a double dose. Retin a gel has an active ingredient called Tretinoin, which is a Vitamin A metabolite that modifies the behavior of skin cells and other intracellular receptors. In essence, tretinoin prevents the formation and reappearance of pimples and blackheads by blocking the skin’s hardening processes. It also facilitates the shedding of old and hardened skin cells to better promote new skin growth. How long Retin A Gel should be used? Given its long and short-term effects in treating acne vulgaris, the use of Retin A Gel regularly is highly recommended by scientists, doctors and experts in the field of medicine. Use Retin a gel for the full course of the treatment, or as advised by your doctor. It may take 7 weeks for a full treatment to be completed but signs of improvement may be visible after 2 weeks. How should Retin-A gel be stored? You should store your Retin a gel below 25°C in a cool dry place. Visit here for more information about Buy Filagra Online.